The Gruyere site. Image: Gold Fields / Gold Road. 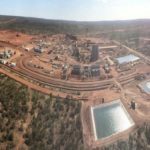 First ore has been mined on schedule at the Gruyere gold project in Western Australia this month. 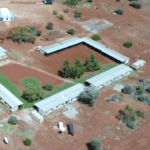 Joint venture partners Gold Fields and Gold Road moved construction of the Eastern Goldfields project to 91 per cent complete by mid-January, the companies today reported. With this progress, Gruyere remains on track for first gold production in the June 2019 quarter. Mining services contractor Downer has started double-shift operations at the site as part of the production ramp up. To de-risk the project start-up a significant amount of ore is forecast to be stockpiled in advance of first gold production, according to the Gruyere partners. 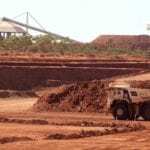 “Construction works in the primary crusher area are substantially complete, with ore commissioning of the primary crusher to coarse ore stockpile circuit in progress,” the JV stated. The JV is also on course to complete development of the project within its forecasted costs, estimated to be $621 million. Gold Fields and Gold Road have forecast Gruyere to annually produce an average of 300,000 ounces over a 12-year mine life. Downer was appointed the operation’s mining services contractor in December 2017 with a five-year, $400 million agreement.